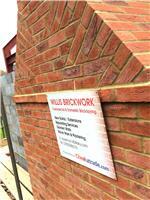 Willis Brickwork - Builder based in Aldershot, Hampshire. Thank you for viewing our company profile. Willis brickwork has been in the building trade for over 10 years with a very happy client base who we have been able to offer quality advice & services along the way. Our services are as follows. We offer a competitive & realistic quote along with polite & respectful staff, Guaranteed start dates & realistic completion times. Are main objective is to consistently deliver a service where quality and craftsmanship unite.We look forward to hearing from you so please call or email for your free quotation many thanks. Laurence Willis - Willis Brickwork.